Medium brown heavy canvas jacket. Sleeves have yellow/tan “blood stripe” detail (printed, suede, embroidered, or similar) from shoulder to cuff. The jacket has a mandarin collar with 6 lines of top stitching, and the waistband also has 6 lines of top stitching. Screen-accurate top stitching and pockets on the front and “action pleat” on the back of the shoulders. Rebel captain rank badge worn on the right breast with 2 green circles. Screen-accurate compad inset above the left front pocket. Tan/beige shirt (linen or similar) with sleeves rolled to 3/4 length and a standing/Mandarin collar, worn tucked into the pants. The front has a rectangular bib with seams on the bottom and both sides which (recommended) continue down to bottom of hem. The outside corner on the upper right side of the bib hangs open and creates a flap, the bottom of which sits horizontally across the chest. The upper left side of the bib, if it functions as a flap, remains closed and sits flat against chest. Double rows of stitching (flat-felled or similar) in each seam is recommended. Dark brown leather (or leather-like) belt with holster. Belt has 8 silver screen-accurate “energy pellets” attached through loops of leather on the left hip; the same piece of leather making the loops weaves in and out of the belt to create a strap detail. 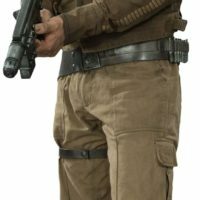 Holster is attached on the right side and has a thigh strap with snap. Belt made of olive drab/khaki/camel webbing with roll-pin buckle. Five silver screen-accurate “energy pellets” are attached via loops on the wearer’s right side. Khaki/camel utility trousers with elastic cuffs at the ankles. Pintuck seam down the front of each leg. Narrow cargo pockets on the outside of each leg, above the knee, each with one center pleat and a top flap. Flat pockets on each side. No back pockets. Dark brown leather (or leather-like) lace-up combat boots with two matching flaps covering the laces. The top of the lower flap of each boot has a screen-accurate buckle. The buckle’s bail (wire piece) is attached with a loop of leather sewn into the flap. The “box” parts of the buckle are black, and the “wire” parts are silver. No visible zippers, but discrete inside zippers are permitted. (Screen used boots are Frye “Sutton Tall” boots). 1. Blaster: BlasTech A280 CFE blaster, weathered black and silver.